You know in life, when you're on one knee and you've given everything you have inside of you to try and win whatever problem you have. But in that one instant where you pick your head up and you look at what's keeping you down, and you rise, you rise to the occasion and you push that obstacle over with one great big shove. That last little ounce of effort, is your greatest ounce of effort. That moment where you dig to the deepest parts of your heart, soul and will to make something happen. I like to attribute that to God & his will. He gives us the strength we need to succeed in the times that we need it, now when we want to. He gives us obstacle after obstacle to teach us important lessons that pertain to that particular person's life. Basically he knows what each of us needs to quiet our minds, and humble our hearts, all while teaching us an important lesson, trust in him. Basically since the start of the new year, a lot of good, hard working people have been running into a lot of problems. Whether it be financial, not being able to move on to something better because of the job market, or timing just being off. I had a few discussions with people and they expressed how they just wanted to start doing new things so they can live and enjoy life. They tried so many different ways and nothing ever seemed to work. But after having conversations and reminding them to not give up because the first thousand ways didn't work out for them, all they needed was that one. My mother told me something that made sense, "Keep doing a whole bunch of things, eventually one of them will come out of it, and that's what you're going to do. Don't ever settle though, you're too young for that." And that's exactly what I didn't do, settle. So after fighting and making some very big decisions that would have taken me away from where I am now, God stepped in and said "nah playa, this is where I want you to be right now, so here, take these jobs". Just like that, I'm back and in better business. 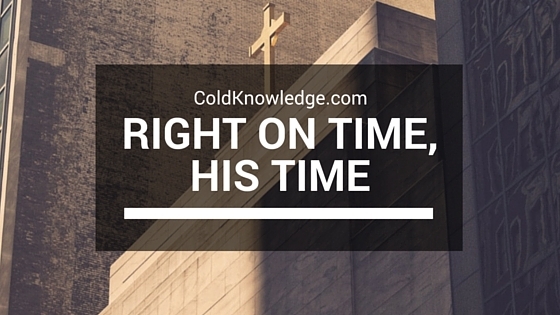 The thing is, we never know exactly when it's our time to do something, only God does. He gives you situations where you think is too much, but really it's not. He may show you a situation that you want to be in badly, is over, but it's really not. Sometimes he wants you to wait things out, or he wants you to come back to them after being away, either way, only he knows when it's time to do something. I made a crazy high goal of saying "this is what it's going to take to keep me here", and he turned around and gave me that and much more. It's significant what he did because I had so many plans that I was giving up on that I didn't want to and he turned around and made it happen. In our darkest hour he will always be there for us, he will be the light to the end of the tunnel and nothing, and I mean nothing that has happened or will happen, would not be without God's love and insight on what is best for me. So with that being said, I thank God for making me learn a lot since the start of this year, and teaching me to not give up on things that I want to be included in my forever. Later guys, keep your head up, remember, there's nothing you can't handle without him, so trust that things will get better, in due time. I'm going to leave you with the Yolanda Adams performance from the 2014 BET Awards, Jesus Is Love, for the Lionel Richie tribute. Man I just have to say that I've listened to this song and it just put me at a greater appreciation of how he always just knows man, he really does. If you sit back and look at all the things that goes on in your life and where you could be, and where you could potentially could head, then you just know he's real. I look back at all the struggle and I'm just that more grateful man, I've came a long way in life. & it's all because of him.